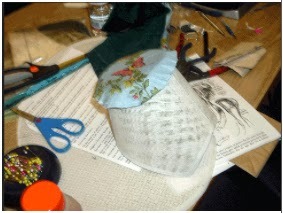 Back on April 30, 2006 The Greater Bay Area Costumer's Guild offered a Hat Workshop with the very talented Lynne Taylor. 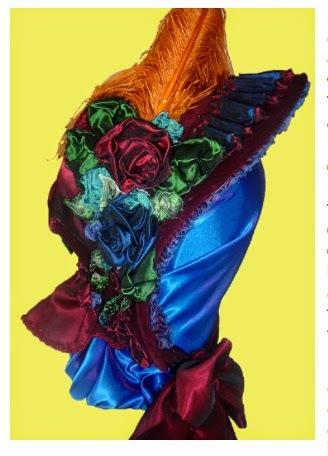 You could choose to either make a Victorian or Regency style bonnet and I opted to make the Victorian. 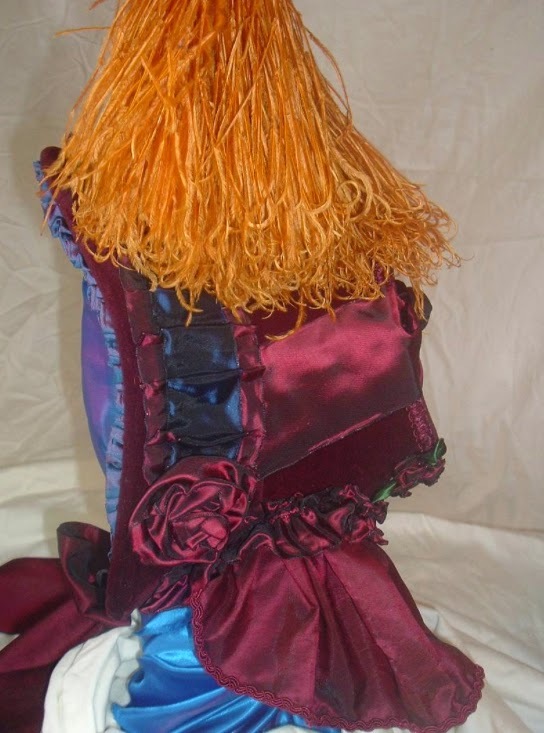 Lynne is an incredibly talented designer and costumer. 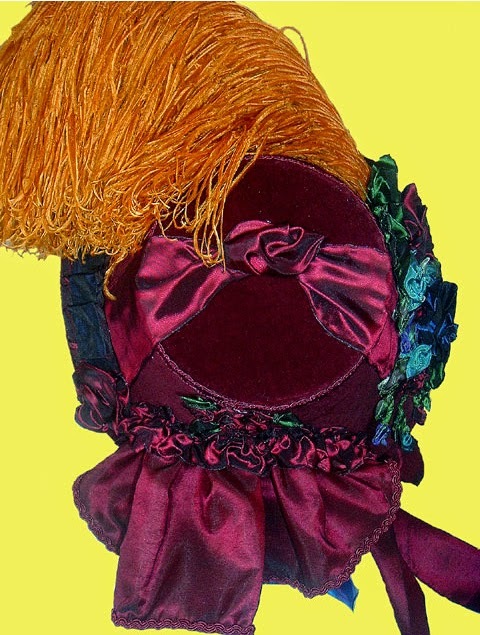 Not only does she do incredible costumes--her hats and recovered parasols are true sights to behold! To the left you can see my finished creation. I took this class to learn more about working with buckram and got more than my money and time's worth. I really got into making this hat. Though I may have gone a little overboard in decorations, each step to finishing my hat taught me something new. 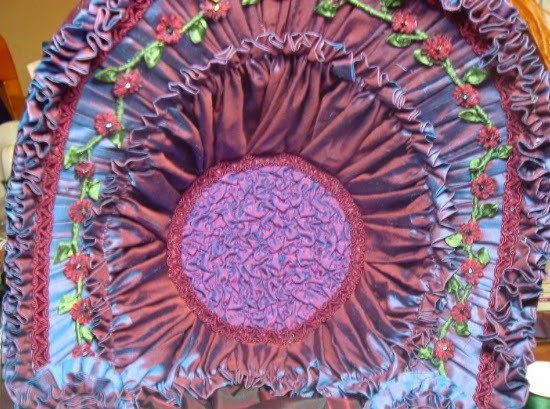 Read on to see step-by-step on how I finished up my hat. of hat you wanted to make and take turns with all the other students copying your pattern on to the buckram, transferring all the marks to your pattern with pencil and cutting it out. Next you use your pattern to cut out your fashion fabric. So that we did not have to "mull" our hat (a cushy lining that provides a smooth surface to cover with fashion fabric) Lynne asked us to select a heavier fabric (velveteen for example). I chose a nice claret-wine colored vevelteen. Now it was time to start covering the crown of the hat. It was interesting to see all the different types of fabric people chose for their hats. Everyone works at their own pace and we all needed to finish up our hats at home. I was able to cover both the outside of my brim and crown at the class. Now, using Lynne's typed instructions I needed to add my lining and finish my trims. 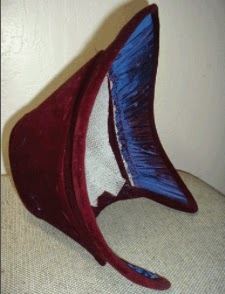 I used my lovely silk shot claret/blue fabric for the lining. 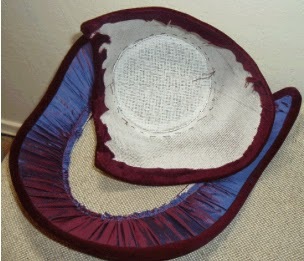 I ran a double line of gathering stitches on one end of the fabric and glued it to the inside of the brim. Then I stretched the fabric creating pleats as I went along. Using FabriTac I glue it all down. To finish off I cut bias trim out of the velvelteen, sewing it down on the outside and then gluing it down on the inside (boy I love FabriTac!). Now I'm ready to put the crown and the brim together. Note: Don't want you all to think that Lynne taught me, or any one else in the class, gluing techniques. Lynne hand stitches everything- but says we can glue if we are so inclined. It's always best to learn to do this the correct way. 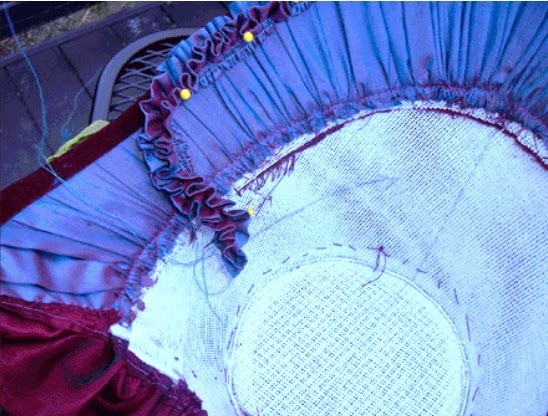 And think about it, if you are using vintage lace and trims you should not be gluing them down. I did do a lot of hand sewing but did glue some things because of my lack of strength in my fingers due to oncoming arthritis. I cut long strips of the lining fabric and made a 2" wide tube of fabric. I then folded it in half and ran two gathering stitches at the bottom and gathered it up. I glued this on to the lining fabric in line with the brim. 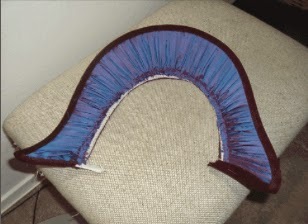 I then glued claret braided trim to hide the gather stitches. Very frilly and feminine I think. Below are a couple of close-ups of the inside trim. I had no set idea when I started on trimming. I like to make ribbon flowers--heck, just like ribbon trimming period. I made a visit to The Ribbonerie in San Francisco (which sadly is not there anymore) to shop for my trims. Ideas formed and inspiration seemed to come as I went along. 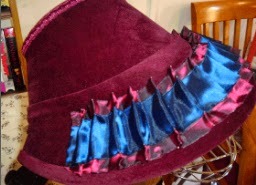 I layed two pieces of blue and claret-colored wired ribbon and formed very short accordion pleats and layer them across the top of the brim. I didn't have that much to go all the way from end to end but I knew I'd be adding other trim so the ends would be covered. 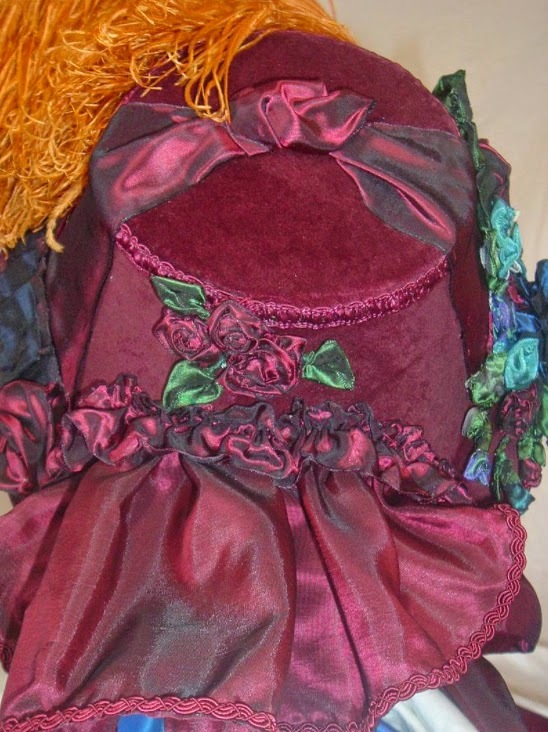 I made various roses in different colors of ribbon and then sewed them on to light-weight crinoline. 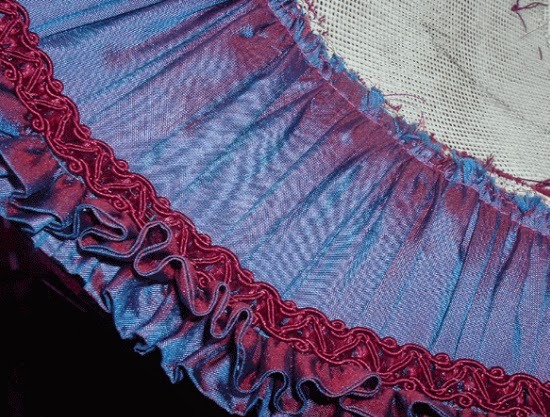 Below you can also see how I lightly sewed then sewed them to the back of the crinoline (see photo below). When finished I glued the arrangement right on to the hat. 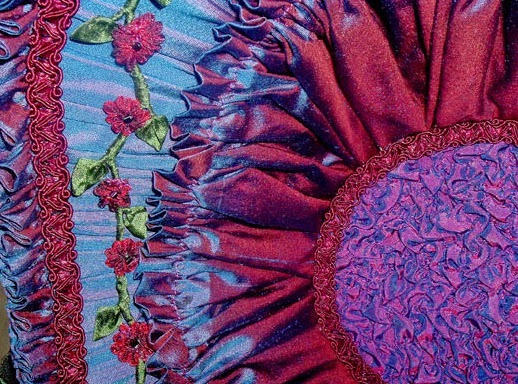 I decided I want the look of a leaf and flower-covered vine to frame the inside of the brim. At first I thought I would use ratail but I didn't like the way-to-shiny appearance. 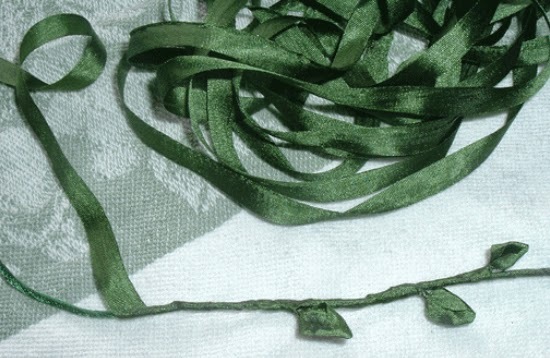 I took some 1/4" green silk ribbon and, using FabriTac, I rolled it around the ratail. Every inch or so I added little leaves that I also made from the green silk ribbon. 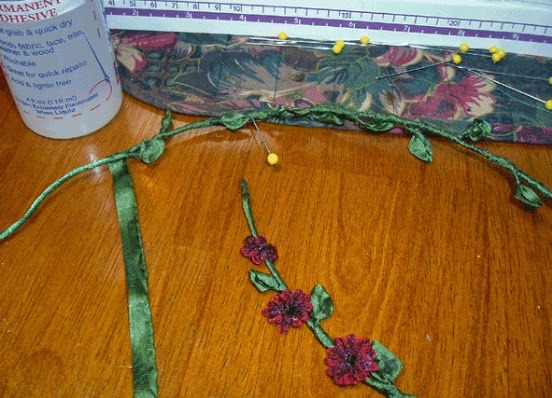 Then I took some varigated claret-colored silk ribbon and made 5-petal flowers, finishing off with a little bead in the middle. These pictures below give you and idea of how I put these together. I made more long fabric tubes, folded them in half and ran two gathering stitches along the bottom again but this time sewed them down on crinoline in a rose-like pattern. I made 3" wide ribbon ties from claret taffeta to match the bavoluet (the skirt-like curtain at the back of the hat) and glued those down. 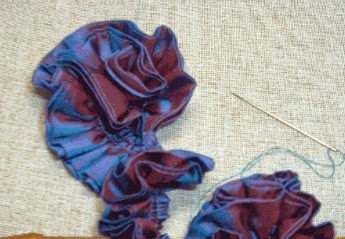 Then I glued the rose frills on top the ribbon ties. I did not have enough fabric to finish the lining so I took my last little swatch and trundled off to Britex (San Francisco's extraordinary fabric store to see if I could find a match. 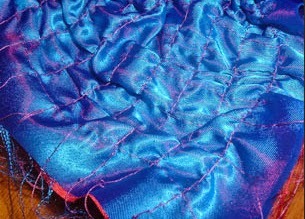 I found some polyester taffeta that was close but very stiff. I washed and dried it which softened it up quite nicely. I sewed gathering threads about an inch and 1/2 apart in both directions to make 1.5" square patterns all the way across the fabric. 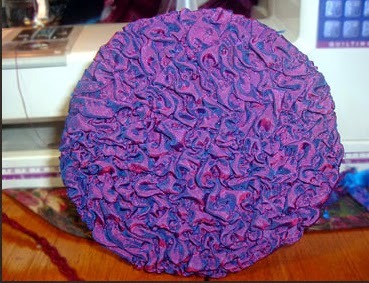 When gathered up it made a lovely squishy pattern. I cut out a thick paper circle that matched the crown top piece and glued the fabric around it. After I finished with the inside crown wall lining I glued the circle down in to the top and then glued claret trim around it to finish off the lining. Whew! You create amazing bonnet. And thank you for sharing such a hard job. I couldn't find patterns. 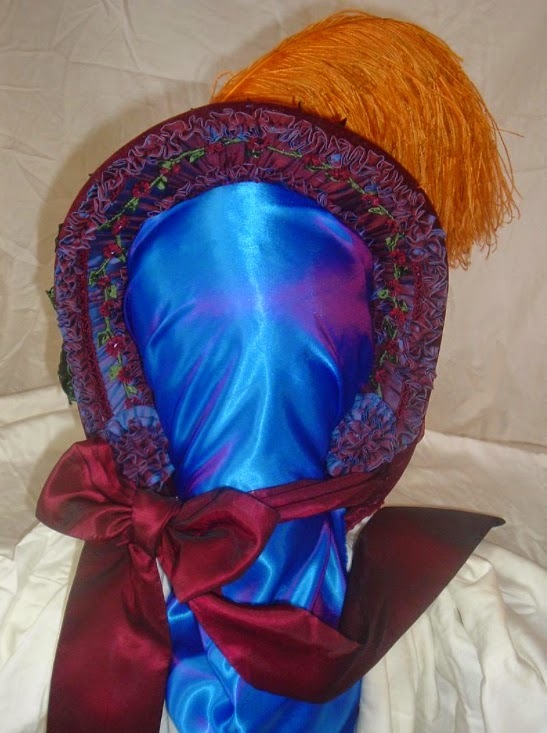 Is it possible to get it, because I really like shape of your bonnet.